Spread over every continent, with a population of 1.6 billion people which is 30 per cent of the world population. 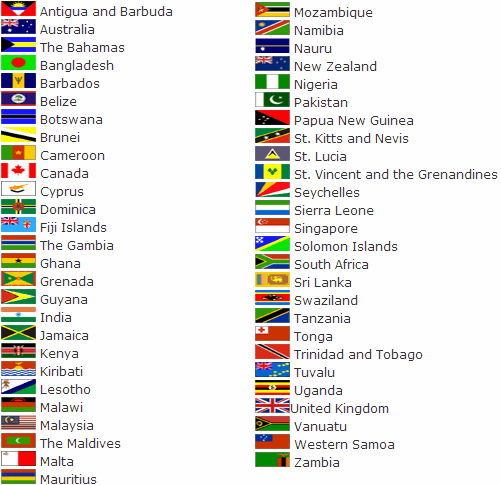 There are 53 current member countries of the Commonwealth. These are listed below. All recognise Her Majesty Queen Elizabeth II as the visible symbol of the free association of nations and, as such, as Head of The Commonwealth. Among other things, Her Majesty attends the biennial Commonwealth summits, or CHOGMs, and the Commonwealth Games which are held every four years. At the Edinburgh summit in 1997, for the first time, she addressed the opening ceremony. On every Commonwealth Day a special message from The Queen is broadcast in all member countries. The Queen has visited Commonwealth countries throughout the world. Information above from the Commonwealth Secretariat and the Royal Commonwealth Society.